for research. As a family history writer, it is also very much a part of my writing life. I outlined in detail how I combine Scrivener and Evernote to create my personal workflow for writing family stories, in my ebook Getting Ready to Write. However, today I want to look at Evernote as a travel app for your next family history trip. Regardless of whether it’s a one day trip to an archive or you’re crossing an ocean to an ancestral hometown, the Evernote app can be an incredibly useful tool in organizing and preserving your trip information and memories. Let’s break it down for a moment and dream we are heading over to France to research our family lines. Here’s how you'll organize your trip in Evernote, essentially creating your own travel app. First make a stack for your trip. A stack is basically a collection of notebooks or files. Give this stack a name, call it France Trip or whatever fits your fancy. Each one of the notebooks in the stack will house a different group of items for your trip. Here are the various notebooks you can create in your France Trip Stack. In here, you have the ability to designate which notebooks you would like to access while offline. This comes in handy if you’re traveling internationally or somewhere that you may not have Wi-Fi access. While you are in the premium settings you can passcode protect these files giving you extra security. These are both premium features, along with extra storage, the ability to search within documents, note history and shared notebooks. If you’re not a premium user and on a budget, Evernote has a budget friendly $5.00 a month option, just revert back to your free version after your trip is over. Now let’s take a look at what we will file in each of these notebooks for your family history trip. As you begin making your travel plans keep a digital copy of all of the above items in your travel documents notebook. A great way to reduce the paperwork you carry with you, or if you still feel more comfortable with a piece of paper then feel secure knowing you have a digital copy should the hard copy go missing. Of course, you must carry a hard copy of your passport, but keeping a back up in your Evernote app is a little added insurance. Even your airline ticket can be saved into Evernote, no paper required. Check in online, and save your digital boarding pass to Evernote. When you get to the airport open up the Evernote app on your phone and scan your digital boarding pass at the handy kiosks to print out your luggage tags, a great way to avoid lining up. Even passing through security and customs, just show them your phone opened to your boarding pass; really, I’ve done it, very easy. I know it’s hard to break away from the paper but it can be done. While on your research trip, photograph all your receipts as you go. It helps you keep a handle on your expenses and your budget. If your trip is business related, all the more reason to scan your receipts into Evernote and keep them organized. No more searching for missing receipts at the end of the trip when you need to declare them to customs or your spouse. Do you forget where you parked in the airport parking lot? Snap a picture of the location markers before you leave so you can find your way back to your car a week or two later, save the picture in your travel documents. Renting a car, take a photo of the car from multiple angles before you leave, including the license plate and scan the paperwork right into your travel document notebook. The camera options include capturing post-it notes, documents, and business cards as well as your typical photo, making it an easy one-step process located within the Evernote app. In this notebook you can keep a day by day plan of your trip. You can keep various to-do lists, The Must See, Like To See and If There’s Time lists. It’s always good to prioritize your time before you leave. I believe in having a plan that has room for flexibility. In this notebook, you can file articles and guides you been reading prior to your trip. Save them for easy reference to times, ticket prices and locations. Keep maps, town maps along with any transportation maps you require such as buses, trains and subways. Include in this notebook, a list of recommended restaurants with addresses along with the archives, museums and cemeteries you wish to visit–with location and hours of operation. The itinerary notebook is a great place to save anything and everything having to do with your sightseeing activities for your trip. In this notebook you want to keep all information about your planned research. Start with a well thought out and identified research plan. Include group sheets, documents, pedigree charts and any information you may want to reference during your research. Take as much as you like no weight limit here, no heavy binders to carry. If you wish you can have more than one research notebook, consider designating a different notebook for each surname or ancestor you will be researching on the family history trip. If you already have a research notebook set up, you can temporarily relocate that notebook into your Trip Stack for the duration of your time away, no need to duplicate your work. Now that you used the Evernote app to plan and prep for your research trip consider its capabilities for capturing your memories while on your trip. This is really where I found it to be huge breakthrough in my travelling routine. I love to keep a travel journal. As a writer, a travel journal is so important to capturing the sights, sounds and smells of the world around me. Of course, if I’m travelling to an ancestral hometown, a travel journal is a great tool to record my journey while I walk in my ancestor’s footsteps. Even if it is just a single day jaunt to a nearby archive, I love to note the environment around me. It fuels my writing on every level, regardless of whether it’s a blog post, article, family history story or fictional writing. They are a task. I don’t like to carry a journal on my day to day excursions. I like to write in my journal when I get back to the hotel at night. Sometimes that can be an overwhelming chore when you’re exhausted from a day tripping around town. Usually, I have the best intentions but exhaustion sets in especially after a couple of days and writing at night becomes an impossible feat. I convince myself I will make some notes in the morning, then that becomes sporatic, one day turns to two and then the days start to blur. The idea of keeping a travel journal can be a very romantic notion. However, I needed to get practical and smart with my time and technology has given me that ability. Evernote allows me to save pictures, notes and record audio recordings immediately into my travel journal notebook. If I’m too tired to write in my journal, I can always snap a picture or add an audio note on the go that will help me recall my day. With the Evernote feature, I can create notes on the go, not too many, I want to live in the moment but just enough to capture the information I need that I can easily expand on later when I'm rested. There are two ways you can set up a travel journal. Create a notebook for each city or country you will be visiting with more detailed tags. Here’s some things you can save in your travel journal. Within the Evernote app you can take a photo that will be logged immediately to your travel journal. Snap photos of attractions, food, people, signs, research and save to your travel journal. Make a quick annotation and comments at the time or review them later that day either with a text or audio note. Evernote will auto-tag the picture with the date and location. Touring always provides plenty of insightful information on historical plaques, I like to take a picture of the plaque so you can recall what you read later. In your travel journal, don’t forget to take lots of pictures of food, wine bottles and the new favourite beer you had at that cute little pub. Take pictures of local or quaint stores that you may want to share with family or friends later, on Facebook or in your family history blog. Of course, you must document the people on your trip, not only your travel companions but the locals you meet along the way, including the researchers at the archives, the museum curator, local shop owners; they all add substance to your memories and your travel journal. With the audio app you can also record the voices of those locals, (with their permission of course)whether it's a tour guide, distant cousins, a museum curator or local genealogist who has plenty of information to share. No mad writing genealogist required, with a click of a button you are saving your audio file directly into your travel journal. Once you've returned home use the Places feature on the home screen of your phone app to view your notes and their locations. All notes, whether it’s a picture, text or audio will appear on a zoomable map of the world. Tap the pins to your notes and relive your memories. Evernote is a great tool for planning and recording your next family history trip. It gives you the features to create your own travel app specific to your trip. Use it to document the sights, sounds and impressions of your trip, keep your plans organized and documents safe but most of all capture your memories of your next family history trip using Evernote. 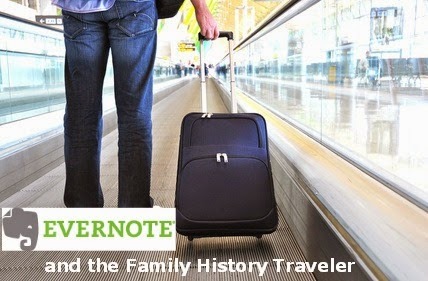 How have you used Evernote in your family history travels?